My name is Michael Kojo Ankobia originally from Accra, Ghana but brought up, live and work in London, England. I am educated to MSc degree level and currently going through the process of applying for Chartered Engineer class. I have over 15 years’ experience in a wide range of engineering industries, such as Aerospace, Construction, Defence, Energy, and Transportation. I currently work on a contract basis as a Senior Mechanical Design Engineer in the Transportation industry. I thoroughly enjoy working on production, project work and being part of a dynamic, forward-thinking team. What challenges have you participated in? What kind of challenge do you like most? I actually enjoy all types of challenges, I’ve always had a competitive nature and regularly push myself to do more personally, in business and in general. 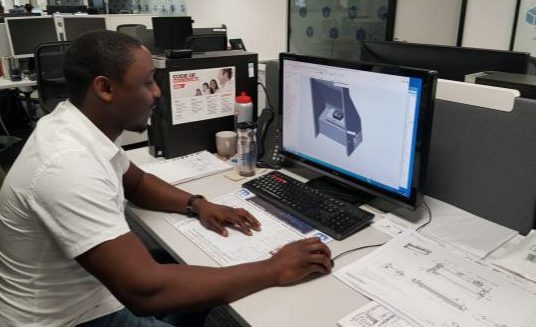 As my background is in mechanical engineering, I have a good understanding of creating new products or services, manufacturing processes and marketing strategies used to successfully bring the new product or service to the marketplace. I believe in life if you train yourself to be comfortable in the uncomfortable, you will be well prepared to handle whatever life throws at you. I have a passion for engineering, using engineering to improve the world we live in. That said, the cash reward and percentage of intellectual property is always a good motivator. I pride myself on producing smart, low cost, sustainable solutions, and the “Alternatives to Recycling Bits of Wooden Boards” challenge focused mainly on these factors. Did you have any experience with this kind of challenges? No, this is the first time I have entered any competition like this, and winning this challenge makes the whole experience all the more satisfying. I will certainly continue to enter challenges in future and encourage others to do the same. My first thought was to use the bits of wooden boards to make Recyclable Wood Cutlery. I’m aware that because of the well-documented damage plastic is causing to the environment, there is a global consensus to find alternative materials to replace single-use plastic products such as plastic bottles, plastic cutlery, plastic bags, straws, food packaging etc. However, when I put together the Recyclable Wood Cutlery business case, I found that my original idea did not have any potential for large profit margins. I felt a product with the potential for large profit margins would make an impact in the marketplace and therefore lend itself to building a sustainable business model for the long term. So after giving it further thought and some general research, Affordable Roof Tiles was born. According to official data, at least 65 million people live in slums across India. Most live in makeshift homes and shacks built with bricks, mud, plastic, tin, and roofs of cement or corrugated metal, usually covered with tarpaulin. Cost, people have to choose between the affordable but inadequate options of corrugated metal or cement sheets and the adequate but unaffordable option of concrete slab roofs. There is the additional cost of maintenance and as a result, residents use what they can for repairs. Insulator, metal roofs act as an insulator in the summer this makes the house extremely hot but doesn’t in the winter when it’s needed. Noise, metal roofs can be noisier than other alternatives. Toxic, some corrosive metals are toxic and can cause health problems. Unstable build, in the event of flood, earthquake, lightning storm and fire, unstable roof builds can become very dangerous for the residents living in these conditions. What are your expectations about working with Masisa? I’m excited to meet and work with the wonderful people at Masisa. I intend to travel to see them in person, to see their production plants and cutting centers. However, I will definitely need to brush up on my Spanish. If you would like to get in touch with me about any ideas or engineering projects, please contact me via LinkedIn.